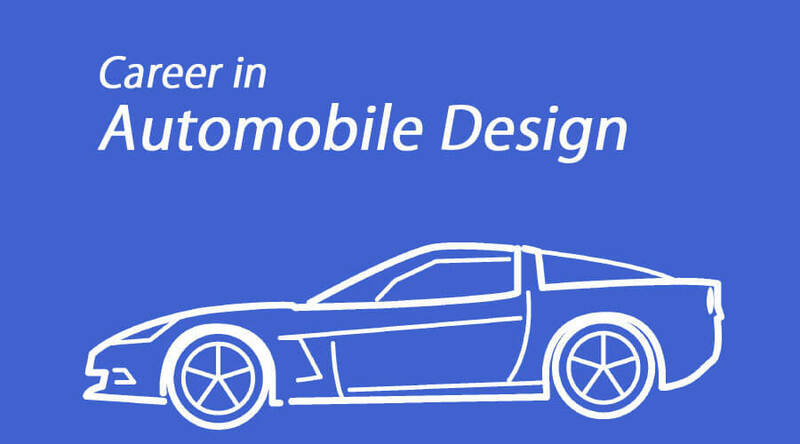 In this topic, we are going to learn about Career in Automobile Design. When you search the word “Automobile” the result you get is “a car” and it suddenly becomes simple to you. We all have seen cars and many of us may have owned one. But when you get deep into it you get to hear many terms such as combustion engine, suspension, propulsion system etc. and that’s when it gets tricky. An automobile is not as simple as it means, it is complex machinery. There are many internal systems that are used together. To build an automobile, a team of highly skilled and qualified professionals is employed. One of the professional in production of a vehicle is the designer. In a sense, they are the initiator of the production of an automobile. Automobiles designers are engineers that create a new design for vehicles and not only improve its structure but also its functionality. While doing so they must keep in mind about the safety of the vehicle and operate under given parameters. Simply put they are responsible for building a good looking and comfortable vehicle that appeals to the customers. Draft designs of automobile parts, assemblies, and systems using drawings, models and prototypes. Primarily work toward improving the visual appearance of the vehicle. Automobile designer works in one of three regions- interior designing, exterior designing or color, and trim design. Must have detailed knowledge about hydraulic, electric and mechanical systems that are going to be used in the vehicle. Prepare designs with details of shape and colors using Computer Aided Design software. Should understand the complete requirement of the client and research extensively about uses of design and its production. Automotive engineering requires creativity. One should have genuine interest and passion in automobiles. They should have a vision and ability to look outside the box. Automotive designing is a very competitive field, a high level of academic degree is useful when searching for an entry-level job. When applying to be an automobile designer one must possess a minimum bachelor’s degree in industrial design. Specialized schools that have close relationships with automobile companies and established universities with designing programs that are well respected in the industry are both good alternatives. Most courses focus on designing the vehicle, functionality of the vehicle and its dynamic. So it is crucial to carefully choose the college as well as the courses offered by them. Besides having a college degree, it is important to gain work experience with and around vehicles. If possible, invest some time in an automotive shop to see how vehicles are assembled and function. Doing internships definitely helps in increasing one’s knowledge and creating zeal in building vehicles. And not just for knowledge, a person can leave an impression during their internship which may be useful later in their employment process. Some designers opt to pursue a master’s degree in the possibility of getting higher pay and as the competition is tough a high level of academic degree is beneficial for obtaining a job. Learning a different language will be advantageous and an add-on in your portfolio as many automobile industries are located in different parts of the world. Generally, an automobile designer works with a styling team throughout the design process of a vehicle. At an entry level, an automobile designer works as an interior designer or an exterior designer. The main focus of an Interior designer is to make inside of the vehicle as comfortable and functional as it can be. Exterior designers draw what outer structure of the vehicle should look like and after that convert those design in digital form. They then shape their structure in three-dimension. As their career progress, they can be promoted to positions of chief designer, managers, prototype engineers. A report submitted by the US Bureau of Labour Statistics(BLS) does not specify accurate salary but states that median annual salary for industrial designers in May 2017 was just a little more than $65,000. The salary of a designer may vary based on different parameters such as experience, employer and location. At a minimum, a bachelor’s degree in industrial design is required to get a job as an automobile designer. Some prior experience will always look good on the portfolio. Good knowledge of maths and a fine understanding of Computer Aided Design(CAD) software can help in gaining employment. To be an accomplished designer one must be visually creative, have good imagination who can think out of the box. Good communication skill is necessary to communicate your ideas to the client and to your superior and in understanding their requirements. Good research skills and a high level of analytical ability. An innovative approach that can be used in problem-solving. Good commercial awareness and ability to work under tight schedules. The job outlook for automobile designers is expected to grow only 2% to 4% from 2015 to 2025 as stated by the US Bureau of Labour Statistics. This grows this slower than the average for all other careers. Automotive designers could see somewhat greater growth than this as the current focus is on developing electric, hybrid and generally more eco-friendly vehicles. As vehicles become more technologically complex and fuel efficient to meet consumer demands, prospective designers should be ready to compete fiercely for employment in the industry. Drafters use computer software to convert the designs into a plan and technical drawings that are needed to begin production of the vehicles. They take rough drawings and use their skills to generate a scaled image that can be used to construct prototypes. Their duties are to add details to the architectural plans by specifying dimensions, materials, and procedure for the product. This career in Automobile Design is not too advance in the automobile industry as compared to ones we talked. Their main work is to oversee the production of automobiles. These technicians or engineers analyze the manufacturing process and find ways to make the process more efficient by reducing time and cost and improving quality and workflow. The responsibility of a technician also includes client satisfaction. This Career in Automobile Design is for those who like to focus more on design for artistic and presentation purposes and less on industrial applications. A major responsibility of the designer is to present data in a manner that can be easily accessed and is distinctive.